Two members of the same Donegal family have now been ordained. Fr Joseph Briody was present to see his brother Anthony, ordained Deacon on Easter Tuesday, 3rd April. 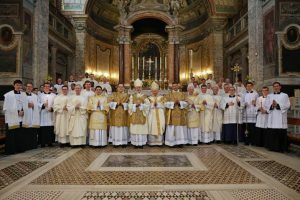 In the Basilica of Saint Prassede, Rome, Bishop Alan McGuckian SJ, Bishop of Raphoe, ordained two seminarians to the diaconate, namely Reverend Anthony Briody, from the Diocese of Raphoe, and Reverend Declan McGeehan, from the Diocese of Derry. The two deacons live at the Pontifical Irish College in Rome, where they are studying for the priesthood. In his homily drawing on the Gospel of the day, Bishop McGuckian reminded the two candidates of Mary Magdala’s capacity to follow the Lord even when it seemed as though all was lost. The Bishop urged the two new deacons to live a lifelong commitment to diaconal service especially after ordination as priests. Reverend Anthony Briody who hails from Glenties, Co Donegal, was a Human Resources Manager, and Reverend Declan McGeehan who has previously been on placement in Derry, are in their fifth year of formation for the priesthood. Also present was Bishop Philip Boyce OCD, the Apostolic Administrator of the Diocese of Dromore. Family members and friends of the new deacons travelled from Ireland. They were joined by seminarians from a number of other seminaries in the city who served the ordination Mass at the Basilica of St Prassede. The Basilica was rebuilt in the ninth century and contains the remains of Praxedes (Prassede), her sister, and innumerable martyrs. Ordination as a transitional deacon generally occurs after a seminarian has completed at least three years of study in theology. 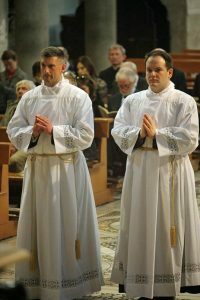 In addition to their assignments as transitional deacons, Reverend Briody and Reverend McGeehan will spend the next year completing their priestly formation. Transitional deacons carry out the same ministry as permanent deacons and are able to preside at weddings; assist the priest at Mass; proclaim the Gospel and preach, as well as preside at wakes and funeral services.